We’re hosting a new section featuring some of the unique league setups of college fantasy football. Because college football has so many teams and conferences, the diversity of types of league formats can be done creatively. Want your league featured? Contact us! 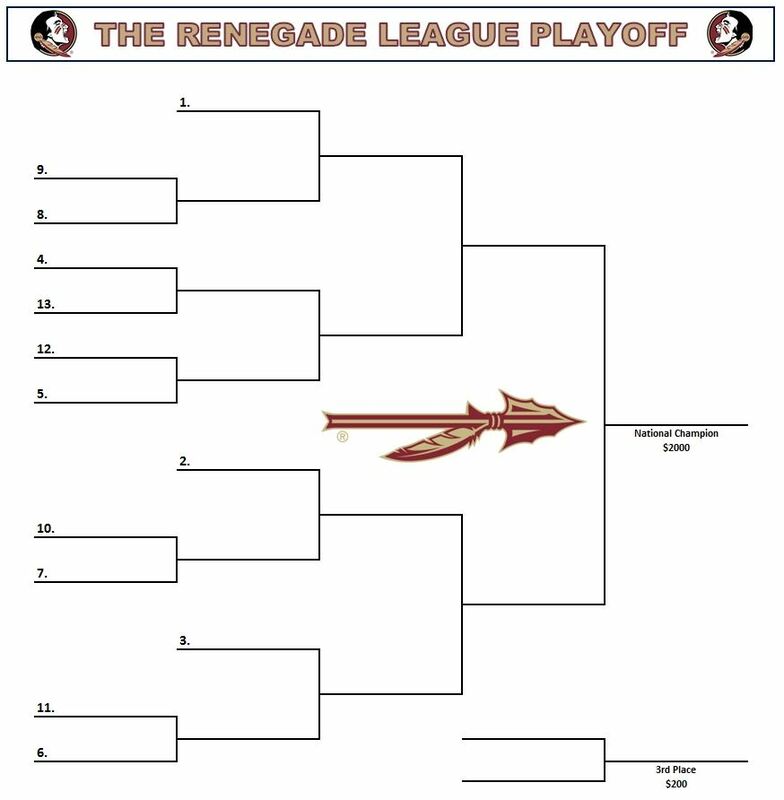 Current League Name: “The Renegade League” or “The Renegade” for short. The champion of the league gets to name it and have it themed after their favorite team for the following season. A Florida State fan won last year’s league. Player Pool: Power 5 plus Independents and American Athletic. The set up: The league consists of 42 owners with a $125 buy in. They are broken up into 3 divisions of 14. These divisions are treated as separate leagues and they have their own player pool. We refer to them conferences. These conferences are named after players from the previous champion’s favorite team for the following season. A BCS/CFP ranking system is used to rank all 42 owners in the league. All regular season games are played within the same conference. The ranking as well as the playoff is made up of all 3 conferences. There may be an instance where a player is owned by both teams in a playoff matchup. The top 3 teams in each conference, based on wins and losses, get an automatic bid to the playoff. The final 4 remaining spots are given to the 4 highest ranked teams who didn’t receive an automatic bid. These are at-large bids. 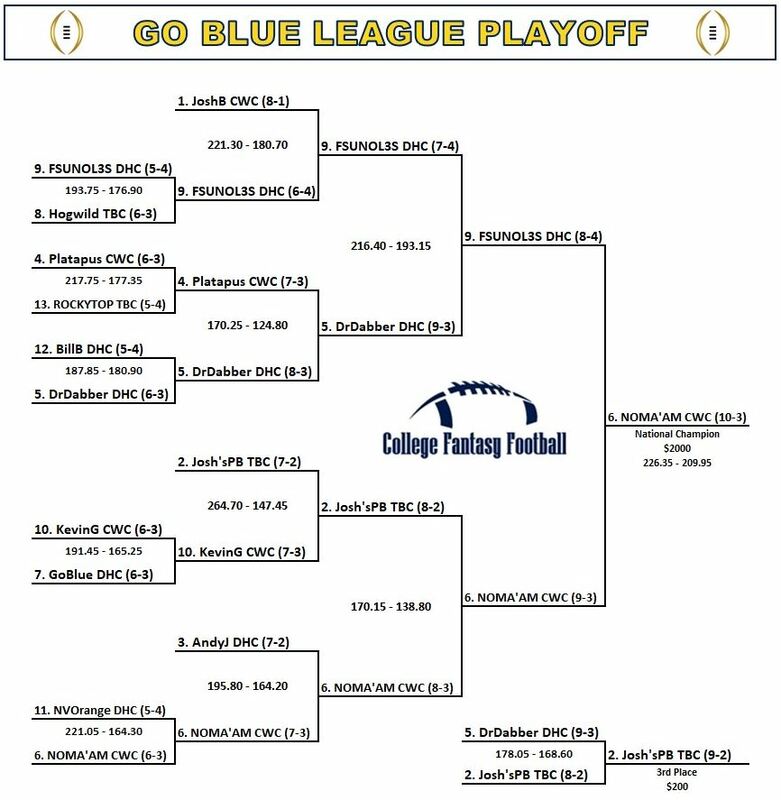 13 total teams make the playoff and the 3 conference champions receive byes. The highest ranked 14 teams who missed the playoff participate in a consolation tournament called the NIT. All owners who didn’t make either of these playoffs participate in another consolation tournament called the CFI. Owners waiting to get into the league participate in satellite leagues. These have a $60 buy in with all payouts distributed within the satellite league. The champion of each satellite league is guaranteed a spot in The Renegade the following season. The owners ranked at the bottom of the BCS/CFP (now called the CFP), are demoted to satellite leagues. Matt Kufta is the commissioner of the league and has been from the beginning. CFFLeague has a committee on rules and changes. Ideas are discussed in the offseason and require majority vote to implement. Kufta has the ability to veto any idea or suggestion that passes. What the commissioner does not have is the ability to implement his own idea without the majority of the votes. The committee consists of 7 total members. It is open to anyone as long as they meet a few simple requirements. History: The first fantasy season was 2011 and it consisted of 12 owners. In 2013 CFFLeague expanded to 14 owners. In 2014 they expanded to 36 owners, with 12 owners split into 3 conferences. 2015 is when they expanded to our current setup of 42 owners.